You will always feel welcome when visiting New Town Chiropractic & Physical Therapy! There is plenty of convenient parking and a well lit parking lot around our facility. You’ll find easy access to our suite from the parking lot through the building lobby. Your first visit will give us the opportunity to get acquainted. When you come in you will be greeted at the front desk, asked to sign in and fill out some important health and personal information. If you have health insurance, please bring your card so we can verify your benefits for you. Our providers will then discuss your health history and current health concerns. This will be followed by a comprehensive examination to properly assess your condition. If necessary, x-rays may be recommended as part of your examination. Our x-rays are taken and findings are interpreted on-site, no need to be referred to another facility for this important evaluation tool. Based on the initial findings, some treatment will be started on the first visit. Can chiropractic and physical therapy help you? Following the first visit, you will be scheduled for what we call a Report of Findings. This is where we will set aside time to discuss the results of your initial examination and make more specific recommendations for a treatment plan that is suitable to your needs. The purpose of your initial consultation, examination and report of findings is to discuss & evaluate your health goals and presenting condition. This information will help you to make an informed decision about your health care. 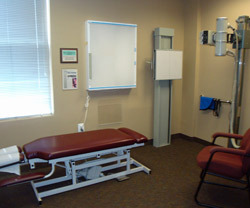 New Town Chiropractic & Physical Therapy patients appreciate that we explain everything in advance!